Here is a selection of five photographic portraits of Wagga women from the Museum's permanent collection. Those women include politicians, poets, housewives, businesswomen, mothers, sisters and daughters. Each of the women chosen has left her mark in some way on Wagga Wagga, whether publicly, professionally, or privately. The women in the photographs span a time period of almost 100 years, and are united by a common thread - their strength of character, courage and fortitude. 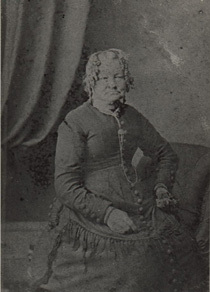 A strong, determined, independent woman, Susannah Eleanor Seymour arrived in New South Wales as a free immigrant on board the Layton in 1833, and although unmarried, had given birth to a daughter, Susannah Hannah on 3 March 1835. In 1841, William "Tinker" Brown, who had been transported to Australia as a convict in 1837, applied for permission to marry Susannah. By 1849, the couple had settled in North Wagga, establishing a slab and bark store, and obtaining a publican's licence for a "New Ferry Hotel" later that same year. Susannah managed the store and hotel almost single-handedly. After the death of her husband, she acquired considerable property, including a boarding house in Fitzmaurice Street, and numerous cottages around Wagga's central business district, which she rented to tenants. Susannah could often be seen travelling around town in a buggy collecting rent from her tenants. She contributed much to the development of Wagga, and was a shareholder in the Wagga Wagga Bridge Company. 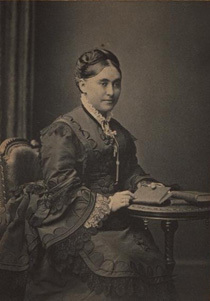 When Susannah Brown died on 10 June 1883, most of her estate was left in trust for her Monkhouse, Moxham and Brown grandchildren with a life interest for her children Hannah and Charles William Thurlow Brown (William's only son and heir, born 1848). She made the unusual step in specifying that her daughter's interest was not to be "subject to the debts, control or intermeddling of the said Henry Moxham her present husband or any future husband she may in turn marry". Despite these provisions it is thought the fortune dissapated whilst held in a trust administered by Charles William Thurlow Brown and an Executor by the name of Hely. Upon his father’s death Charles’ son Robert Sylvester Brown travelled back to Wagga Wagga from Condobolin to wind up Susannah’s estate only to find it had all gone by the time he arrived. 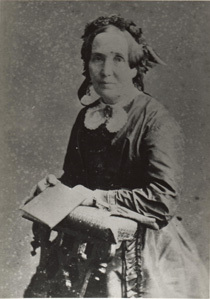 Annie Isabelle (or Annie Isabella) was the daughter of James Grant Ogilvie, a farmer, and Jane (nee Stronach). She was born in Dunedin, New Zealand in 1862. Annie's brother, Will, delighted in telling the story of the courtship of Annie, and her husband Ernest Penry Henningham, the prominent Wagga photographer. According to Will, several young gentlemen would call and enjoy the company of Miss Ogilvie. She played the piano, and they sang, recited poetry and drank tea. Meanwhile, Ernest was in another room playing cribbage with Annie's father. When the young men had said their adieus to Annie, Ernest quickly finished the game of cribbage, moved into the drawing room, and with his good looks and courtly manners, soon won the lady's heart. Ernest and Annie married in 1890, and they had five sons: Ernest Alexander (b. 1891), Malcolm Manley (1894 - 1916), Herbert William (b. 1897), Grant (b. 1901) and Geoffrey Francis (b. 1903). The family resided at their home "Boisdale", in Tarcutta Street, Wagga Wagga. Ernest died in 1914, aged forty-nine. By 1918, Annie had moved to Eastwood in Sydney. On her birthday in 1836, Eliza Esther Pearson, a pretty petite nineteen years old married Frederick Anslow Tompson. Eliza was born in Portsmouth, England and had immigrated to Australia three years earlier with her parents John and Sarah Pearson. After their marriage, Eliza and Frederick lived in comfortable circumstances at Quakers Hill near Sydney, where their first three children were born, with the assistance of several medical attendants and numerous servants. Their situation changed dramatically following the commercial depression of the 1840s, forcing them to sell their farm and move to a Wagga homestead named "Kimo" in 1842. Moves to "Oura" and the station "Eunonyhareenyha" soon followed, as the family chased their fortunes. The Tompsons had three more children during this time, but born in the less glamorous surrounds of small slab and bark buildings. Frederick was appointed the clerk of petty sessions for Wagga Wagga in 1848 and selected a site in the as-yet unsurveyed village, and built the family a house named 'Waterview'. After completion towards the end of 1849, Eliza and the children joined him in Wagga, and the couple produced another five children. Eliza's husband went on to become Wagga's first postmaster, town clerk, was a successful businessman, and had a tremendous influence upon Wagga at its developmental stage. As one of the directors of the Wagga Wagga Bridge Company, on New Year's Day 1862, his wife Eliza was given the honour of driving the first pile into the bridge and christening it with a bottle of locally made Gregadoo wine. Errolla Nanoya Henderson 'Smoke' Heard (née Garland) was born in Junee's Union Bank on the night of 7 March 1904, at the height of the bushfire season. Errolla was called 'Smoke' after her father's prize cow, Henderson after her grandmother's clan, and Errolla for Errol County in Scotland. 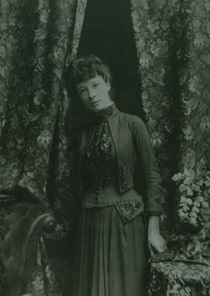 Alexander Edward, Gertrude Garland and their daughter moved to Wagga Wagga in 1910, and the personality of the woman Smoke was to become, started to develop. At the age of 16, she was one of the first teenagers in the district to own their own cars, and receive her licence. So began a lifelong love of cars, which came only second to her love of horses. 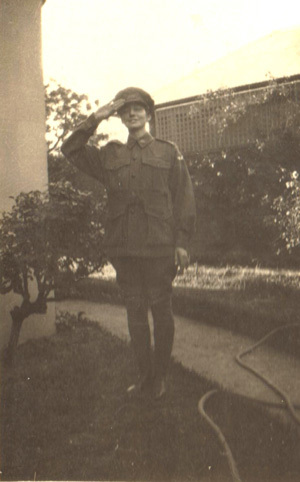 Smoke married Bernard Heard in 1940, and when he was posted to the Middle East, she enlisted in the AWA (Australian Women's Army). She only spent a short time in the army after a truck accident left her with a fractured skull. This event precipitated her move to Sydney, where she began working in a General Motors Factory, then became a taxi and hire car driver in Sydney's Kings Cross, where she remained driving cabs until her husband was made overseer of Kyeamba station in 1945. Smoke had a varied career. She became a proof reader for the Daily Advertiser and worked in that role for eight years in the 1950s, followed by a stint as a teacher of deportment and etiquette, and then a job as a stock clerk at H.G. Palmers. In 1959 Errolla 'Smoke' Heard and Ethel Geoghegan were the first female aldermen elected to the Wagga City Council since 1946. Errolla remained an alderman until 1968 and served a second term from 1971-74. She left Wagga for Drummoyne in September 1977 but often returned for school reunions. She died in Sydney on 25 December 1991. Enid Elizabeth Stewart was born at Moree on 9 January 1896, the second eldest daughter of William John Stewart and Emily Sophia Heydon. Enid's mother died when she was seven, an event that changed the course of her life. Following this, young Enid and her younger sister Clare, who was three, moved to Wagga Wagga to reside with their maternal grandparents, Richard Sutton and Elizabeth Heydon of Kincaid Street. Enid attended Wagga Grammar School, where her favourite subject was music. She studied at the Sydney College of Music, gaining honours in Pianoforte. At the age of 18, she was asked to accompany Dame Nellie Melba in a concert she gave in Wagga Wagga. Enid was involved in a War Chest concert arranged by the citizens of Wagga Wagga in 1916, to raise funds for the war effort. Enid and four of her friends dressed as soldiers, and performed a musical number in honour of the Anzacs. In 1922, at the age of 26 she married George Constant Brunskill, eldest son of Anthony Brunskill of 'Allonby' in Wagga Wagga, and the couple had three children Joan, Stewart and Richard. The family settled on a property at Borambola, Wagga Wagga, but left for Sydney in 1955. 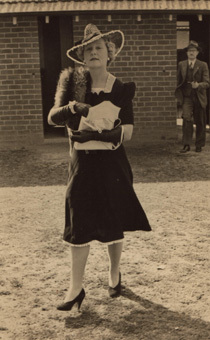 Enid returned to Wagga only in her latter years and passed away in 1981 at the age of 85.